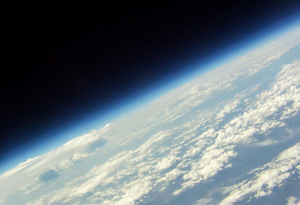 TWELVE YEARS AGO, when high school physics teacher Lou Broad began designing and flying small-scale, high-altitude balloon experiments with his students, video cameras were too big and heavy to make the flight. Fast forward to this past summer's UNH Project SMART balloon experiment in which Broad, two other high school physics teachers, and a handful of high school students flew no less than four video cameras, each smaller than a pack of gum, on a payload package weighing a scant four pounds. 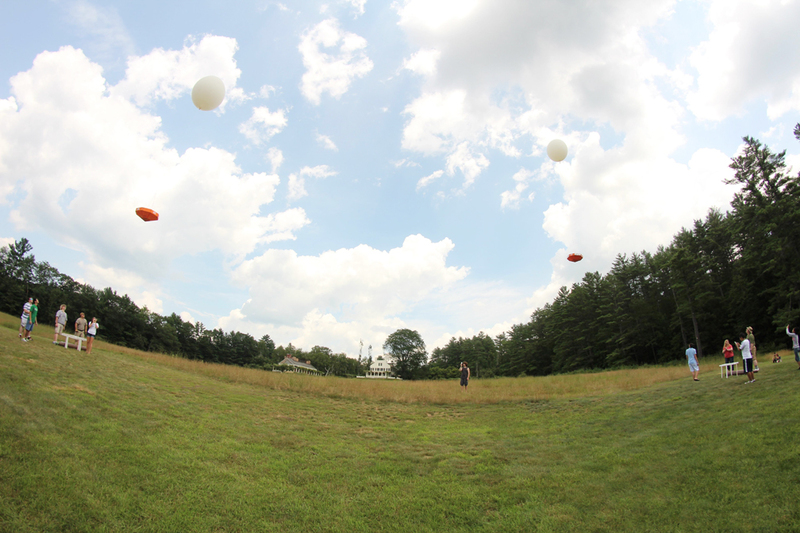 Flight systems Alpha and Bravo seconds after launch from the Saint-Gaudens National Historic Site in Cornish, N.H. summer 2013. Photo by Nick Lajoie, Project SMART. The cameras captured spectacular images of the Earth arcing against the blue-black edge of outer space at 100,000 feet. There, in the cold, thin air at nearly 20 miles up, the helium-filled, house-sized balloon burst, and the three-foot, dish-shaped, Styrofoam and cardboard re-entry vehicle built by students began its slow drift downward for a soft landing without aid of a parachute. The imagery, which made a splash around the world on websites from Discover Magazine to NBC News, is representative of just how far the Project SMART balloon experiment has come in the six years since Broad incorporated it into the long-running UNH summer program. Indeed, not only are the balloons carrying miniaturized video and still cameras that provide stunning visuals, the onboard scientific payloads are now comprised of a sophisticated computer microcontroller that gathers a wealth of data and controls aspects of the flight. "For us, the sky's really the limit," says Broad, who has taught physics at Timberlane High School in Plaistow, N.H. for 20 years. Broad was awarded the 2007 Presidential Award for Excellence in Mathematics and Science Teaching for his balloon work with high schoolers. in readiness for the summer 2012 flight. 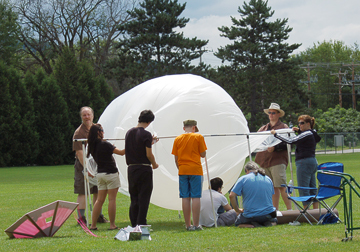 The balloon program has evolved and expanded so rapidly over the last few years that, now, the three regional high schools from which the Project SMART physics teachers hail all collaborate throughout the academic year and balloon launches are conducted outside the summer SMART program. To wit, last spring a nighttime "auroral glimpse" balloon was launched in an attempt to photograph the northern lights high above the clouds at the edge of outer space. And in early December, the three participating high schools plan a night launch to photograph the comet ISON when it passes by Earth. Notes physics teacher Scott Goelzer from Coe-Brown Northwood Academy, "A fall flight is doable because, with the three high schools now participating, and building on what we did in Project SMART last summer, there's no from-the-ground-up design work to be done, we just need to put things together." Adds research professor Charles Smith, who serves as the UNH faculty advisor for the Project SMART space science module, "The balloon work conducted during the high schools' academic year has allowed for the development of, for example, both a new and better platform and electronics flight system. The four-week summer Project SMART program is a very difficult environment for development work. The collaborative efforts of the three high schools have given us the time to explore and build on new ideas that are enabling SMART to function better in the future." And, of course, many more high school students are now directly involved in these unique, hands-on research projects. SMART, short for Science and Mathematics Achievement through Research Training, is a UNH summer residential program designed to help propel high school juniors and seniors towards careers in science, technology, engineering, and mathematics, or STEM for short. Students from across the U.S. and overseas work with faculty in three disciplinary modules—space science, marine and environmental science, and bio- and nanotechnology. For the space science module, each summer physics teachers Broad, Goelzer, and Rich Levergood of Londonderry High School guide the students through four weeks of lectures and research in conjunction with UNH Space Science Center (SSC) faculty and staff. The balloon project and launch is the culmination of the summer's activities. At sessions' end, students also present posters on research projects done in collaboration with SSC scientists who are building instruments for upcoming satellite missions or analyzing data from past and current missions involving UNH. Notes Goelzer, "Their immersion on campus for four weeks is huge, because for a lot of these kids it's their first real exposure to a university, the first time they've heard a university-level lecture. And that's critical, because a lot of these kids are on the fence about going into a STEM major when they go to college." Londonderry High School student Megan McLaurin participated in the Project SMART space science module three summers ago, got hooked on the research being done by SSC scientists, and has been hired by Smith every summer since helping him analyze data from the NASA-European Space Agency's Ulysses sun-orbiting spacecraft and Voyager 1, the latter which recently became the only spacecraft to fly beyond the edge of our solar system. McLaurin is now a sophomore majoring in astronomy and astrophysics at Penn State, one of the top-ranked schools for astrophysics in the U.S.
"Doing this summer program gave me insight into what a career in space science or astrophysics would actually be like," McLaurin says, "and that helped me determine what I wanted to do with my life." Londonderry High School student Megan McLaurin. Ironically, the hands-on aspect of the balloon project, while unique and invaluable for a high school student, was not what interested her the most during her month at UNH in the summer of 2010. Moreover, it was aspects of the balloon project that failed to take flight that were perhaps the most instructive. "One part of the balloon work I liked in particular was how it demonstrated that, in designing, building, and flying, you're going to encounter problems but you still go through with the launch. It demonstrated in a very hands-on fashion that often times science fails," McLaurin says. She adds, "Every summer there's some new aspect to the project because the team builds onto the legacy of past years, and when you have that kind of constant innovation you're going to have errors. It's so valuable for high school students to see how real-world science works, that it's all about problem solving and that it's not just an equation of x equals this, or that answers are either right or wrong." Indeed, Broad, Goelzer, and Levergood all stress that the balloon project has always been modeled on the actual satellite missions that UNH scientists and engineers are involved in—a process that at its heart requires teamwork, problem solving, and some risk taking. Take, for example, the unique, no-parachute design for the payload/re-entry vehicle. It was an idea born in the wake of the summer 2009 balloon flight that ended in a tangled mess: the parachute lines got wrapped around the payload, the re-entry vehicle made a herky-jerky descent, and landed with a thud. In the wake of that failure, Goelzer envisioned the equivalent of a giant coffee filter re-entry vehicle, and Broad then gave his students at Timberlane the assignment of trying to find a shape that would descend in stable fashion. Balloon inflation by the Project SMART team. Recalls Goelzer, "What they came up with is this eight-sided diamond shape we have now—the most stable thing we've come up with yet. Then my students at Coe-Brown took on the problem of calculating and building one that was very lightweight but large enough to carry the scientific payload. 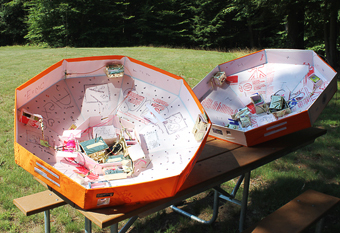 The first one we built was cardboard and foam and ridiculously heavy but this year's model was down to just under 600 grams or about four pounds, and we think we can improve on that." Adds Broad, "These kids walk away from these four weeks with a good understanding that science and engineering is a collaborative process." Also like a real satellite mission, the little mock satellite, which is now collaboratively designed and built by teachers and students from three collaborating high schools and students from around the country attending the summer SMART program, has three basic system components: data acquisition, telemetry, flight control, and recovery. The current sophistication of the balloons' scientific capabilities is due in large part to the miniscule but powerful computer, or microcontroller, that gathers all the onboard data, does some calculations and analysis, and stores it all for after-flight analysis. 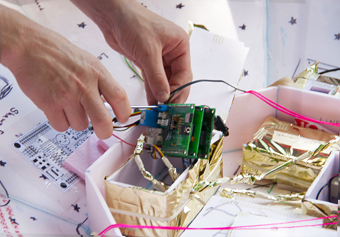 The microcontroller developments are the result of Levergood and his students coming on board beginning in 2011. "For the 2012 flight, we had great telemetry because of Rich's microcontroller, which also provided our first complete scientific data set," Goelzer says. 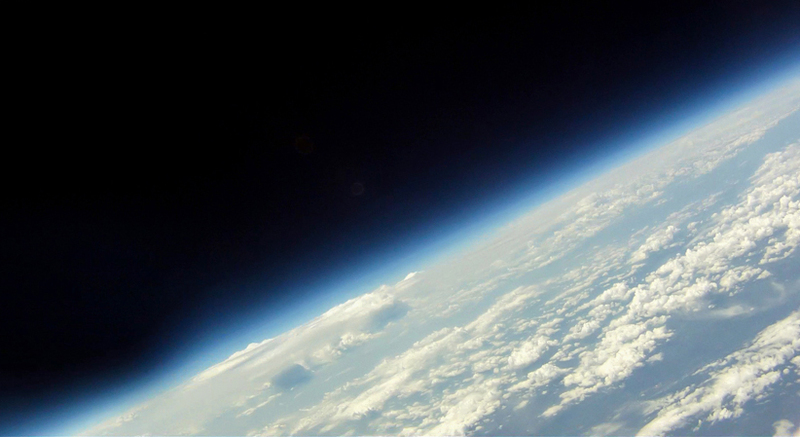 Earth from an altitude of 20 miles (105,600 feet), photographed by cameras onboard the summer 2012 Project SMART high-altitude balloon. Says Levergood, "The students are doing real science that is not coming out of a textbook. They build the satellite components, launch what they created to collect real environmental and performance data and get it back for analysis. It's a very rich experience for them." And the experience gets richer with each subsequent mission. 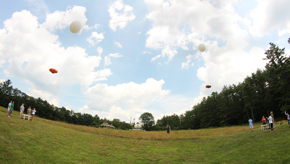 For example, the summer 2013 balloon, which involved twin balloons launched simultaneously for the first time, was to be a proof-of-concept flight for new gamma-ray detector technology being developed at UNH for future NASA space missions. The NASA-funded detector is being developed by SSC research assistant professor Peter Bloser to determine if smaller, lighter detector technology will function properly in the near vacuum of the upper atmosphere—a development that would allow satellite missions to save on critical mass and weight limitations. Although an 11th-hour pre-launch technical glitch prevented the detector from being flown, Broad notes that with both the sophisticated microcontroller capabilities and the stability of the current re-entry vehicle design, these student-built balloons can indeed become a working platform for flying and testing some of the space instrumentation being developed at the SSC.